I have tried to grow several Pelargonium varieties this year and been pleasantly surprised at the various forms and colours I have succeeded in producing. The Grandiflorum is an upright, shrubby perennial with soft smooth stems bearing lobed leaves and large, pinkish-white flowers with dark-purple markings. The plant above I spotted in Chelsea Physic garden this summer. I have long had a plant that resembles ‘Don’s Helen Bainbridge’ that I got from Fir Trees nursery. It has tricoloured leaves and grows only 3″ above the pot. After some success with this variety and liking the small habit I bought a collection of Dwarfs and they have done well in the first year. I will see how my many cuttings now perform. I try feed main plants with high potash feed from spring and indoor flowering has generally been good. Alice and Kerensa have been amongst my favourites with pale flowers tinged with pink. The 3″ pots, I have used, dry out quite quickly and better watering would have produced better plants. I didn’t realise that miniature geraniums were so varied and interesting . 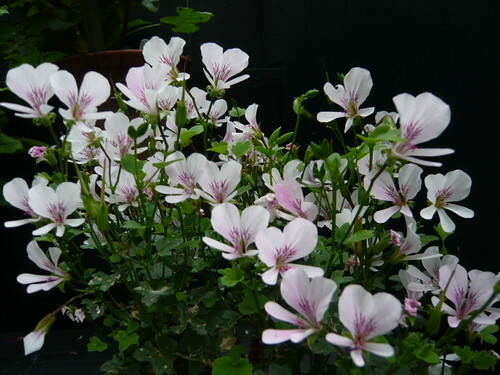 Without a formal description I have taken miniature to mean 4″- 7″ high with smaller than normal geranium leaves. After careful selection I have 6 varieties with neat habits and interesting colour combinations. Angelique has tight double flower heads of deep cerise. They make attractive ball shapes. I also grew an unnamed ‘Regal’ that grew like a miniature but flowered like a massive bedding plant. The fringed, single petals were pink with a white eye. I am now searching catalogues to try identify it. The variegated plants have showy leaves that exacerbate the effect of the zonal qualities of many Geraniums. I found that the more variegation on the leaves the fewer flower buds and the less showy were the flowers. Scented leaved Geraniums were easy to propagate from cuttings. Unfortunately I have not found a use for the scented leaves other than crushing them as I walk past. I recommend developing a taste for growing Geraniums. There is something to keep the gardener interested all year and they are useful indoors, in containers or as bedding.